CN Germany 20A Brushless Speed Controller. Spec. Amp rating: 20A. Burst Rate (10sec): 30A. 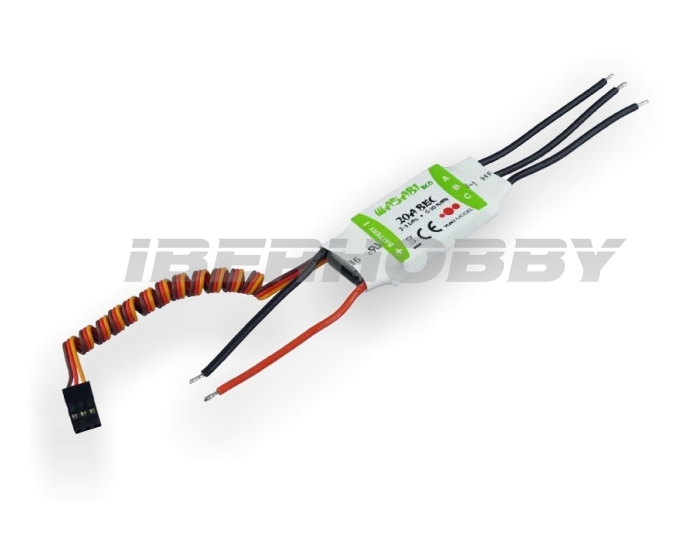 BEC Output : 5.5V / 2A. Voltage: 2-3S. Dimensions: 24x52x8mm. Weight: 26g. Main Functions: Safety mode: The motor wont start no matter what the position of the control stick is when switch on the RC unit. Brake setting: On/Off (factory default is off) Low current protection: Ignore/Reduce power/Shut off Temperature protection: Reduce power when temperature reaches 120C PWM frequency: 8Khz/16Khz Three point battery type and low voltage selection. Software reversion of motor turning selection.